In 10-inch skillet, cook beef over medium-high heat, 5 to 7 minutes or until thoroughly cooked. Add taco seasoning mix and water called for on seasoning mix package. Separate dough into biscuits; press in bottom and up side of pie plate to make crust. Spoon beef mixture into crust. Bake 10 to 12 minutes or until crust is very light golden brown. Top with cheese; bake 10 minutes longer or until cheese is melted. 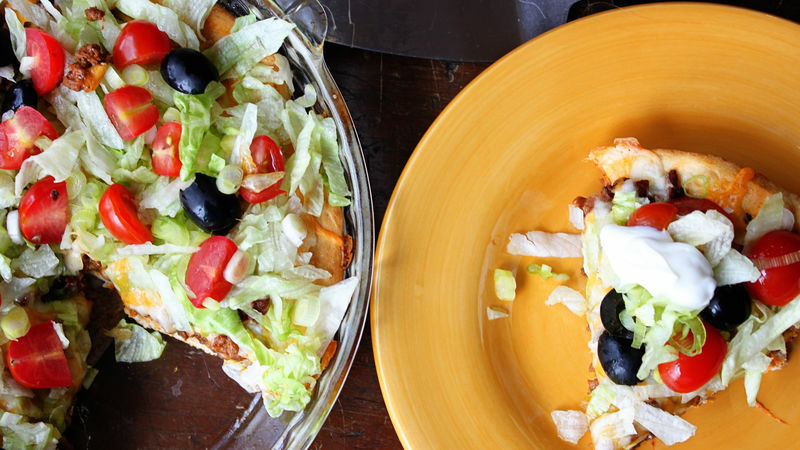 Serve topped with lettuce, tomato, olives and sour cream, or your favorite taco toppings. This pizza can be customized to be topped with your favorite taco toppings like guacamole, salsa and sliced jalapeños. You can also substitute ground turkey or chicken for the ground beef.